For the Mostarda: In a medium saucepan over medium heat, add the white wine, white wine vinegar, sugar, and salt, and bring to a boil. Whisk until the salt and sugar dissolves, about 3 minutes. Continue to cook until the mixture reduces by half, about 8-10 minutes. Add the pears and dried apricots, and cook stirring often, until pears are transparent and mixture is thick, about 10 minutes. Remove from heat and let the mixture cool. When ready to serve mix in mustard oil to taste. For the Porchetta: In a carafe of a food processor fitted with a blade attachment add the pancetta, garlic cloves, lemon and orange zest, rosemary, parsley, chili flakes, capers, salt, and brown sugar, and pulse until it turns into a smooth paste and set aside. Place a roasting rack inside a deep roasting pan and set aside. Roll the pork belly and trim the sides of any overhang and discard. Unroll and place on a cutting board skin-side up. Score the skin just enough to start seeing fat. Flip the belly over, season with salt and pepper and spread an even layer of pancetta paste over the entire surface of the pork belly and loin. With the loin end towards you, roll the belly tightly around the loin into a log shape. Tie with butcher’s twine and place on prepared baking sheet. Refrigerate overnight or up to 3 days. Preheat oven to 225ºF. 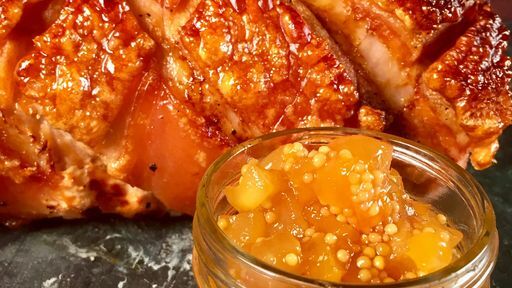 Remove pork belly from refrigerator 45 minutes before cooking. Cover in foil and roast porchetta in oven overnight for at least 8 hours, or until the internal temperature reaches 160ºF. Remove the foil, increase the oven temperature to 500ºF and continue roasting until skin blisters and crisp, about 20-30 minutes. Remove from oven and let rest for 10 minutes before slicing with a serrated knife. Serve each slice with mostarda spooned on top and drizzle with olive oil and aged balsamic. Tip: This mostarda makes a perfect addition to any cheese board!